The United States, United Kingdom, France, and Italy issue a joint statement calling on General Khalifa Haftar to end the offensive. 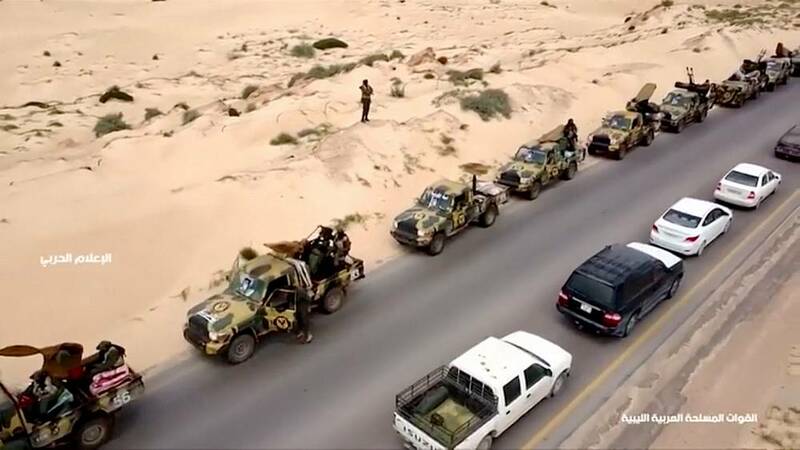 Eastern Libyan commander Khalifa Haftar ordered his troops to march on the capital Tripoli as the UN tries to push for a peace deal. 2019-02-21 The United States' allies France and the United Kingdom say they won't keep their troops in Syria after the United States pulls out. 2018-11-11 Turkish President Recep Tayyip Erdoğan says that recordings related to the killing of Saudi journalist Jamal Khashoggi were issued to Saudi Arabia, the United States, the United Kingdom, Germany and France. 2018-04-14 The United States, France, and the United Kingdom target chemical weapon sites and other Syrian military sites with missile strikes on early Saturday morning Syrian time (EET), in response to the Douma chemical attack. 2018-04-13 The United Nations Security Council meets amid concerns of military strikes in Syria by the United States and its allies following a suspected chemical weapons attack in Syria last weekend, with the United States ambassador to the UN, Nikki Haley, accusing Russia of lies and covering for the government of Syrian President Bashar al-Assad, which she said had used chemical weapons at least 50 times in the past seven years of warfare, and the Russian ambassador to the UN, Vassily Nebenzia, blaming the United States, France and the UK for escalating tensions. 2018-04-10 Anonymous U.S. officials say the United States is considering a multinational military response against Syrian government forces, with experts saying that France, the United Kingdom, and Middle Eastern allies would be considered to help.